Frederick Reines (/ˈraɪnɛs/ RY-nes; March 16, 1918 – August 26, 1998) was an American physicist. He was awarded the 1995 Nobel Prize in Physics for his co-detection of the neutrino with Clyde Cowan in the neutrino experiment. He may be the only scientist in history "so intimately associated with the discovery of an elementary particle and the subsequent thorough investigation of its fundamental properties". Reines sang in a chorus, and as a soloist. For a time he considered the possibility of a singing career, and was instructed by a vocal coach from the Metropolitan Opera who provided lessons for free because the family did not have the money for them. The family later moved to North Bergen, New Jersey, residing on Kennedy Boulevard and 57th Street. Because North Bergen did not have a high school, he attended Union Hill High School in Union Hill, New Jersey (today Union City, New Jersey), from which he graduated in 1935. The neutrino accounted for the missing energy, but Fermi's theory described a particle with little mass and no electric charge that appeared to be impossible to observe directly. In a 1934 paper, Rudolf Peierls and Hans Bethe calculated that neutrinos could easily pass through the Earth, and concluded "there is no practically possible way of observing the neutrino." In 1951, Reines and his colleague Clyde Cowan decided to see if they could detect neutrinos and so prove their existence. At the conclusion of the Greenhouse test series, Reines had received permission from the head of T Division, J. Carson Mark, for a leave in residence to study fundamental physics. "So why did we want to detect the free neutrino?" he later explained, "Because everybody said, you couldn't do it." The positron would soon be annihilated by an electron and produce two 0.51 MeV gamma rays, while the neutron would be captured by a proton and release a 2.2 MeV gamma ray. This would produce a distinctive signature that could be detected. They then realised that by adding cadmium salt to their liquid scintillator they would enhance the neutron capture reaction, resulting in a 9 MeV burst of gamma rays. For a neutrino source, they proposed using an atomic bomb. Permission for this was obtained from the laboratory director, Norris Bradbury. Work began on digging a shaft for the experiment when J. M. B. Kellogg convinced them to use a nuclear reactor instead of a bomb. Although a less intense source of neutrinos, it had the advantage in allowing for multiple experiments to be carried out over a long period of time. In 1953, they made their first attempts using one of the large reactors at the Hanford nuclear site in what is now known as the Cowan–Reines neutrino experiment. Their detector now included 300 litres (66 imp gal; 79 US gal) of scintillating fluid and 90 photomultiplier tubes, but the effort was frustrated by background noise from cosmic rays. With encouragement from John A. Wheeler, they tried again in 1955, this time using one of the newer, larger 700 MW reactors at the Savannah River Site that emitted a high neutrino flux of 1.2 x 1012 / cm2 sec. They also had a convenient, well-shielded location 11 metres (36 ft) from the reactor and 12 metres (39 ft) underground. On June 14, 1956, they were able to send Pauli a telegram announcing that the neutrino had been found. When Bethe was informed that he had been proven wrong, he said, "Well, you shouldn't believe everything you read in the papers." From then on Reines dedicated the major part of his career to the study of the neutrino's properties and interactions, which work would influence study of the neutrino for future researchers to come. Cowan left Los Alamos in 1957 to teach at George Washington University, ending their collaboration. On the basis of his work in first detecting the neutrino, Reines became the head of the physics department of Case Western Reserve University from 1959 to 1966. At Case, he led a group that was the first to detect neutrinos created in the atmosphere by cosmic rays. Reines had a booming voice, and had been a singer since childhood. During this time, besides performing his duties as a research supervisor and chairman of the physics department, Reines sang in the Cleveland Orchestra Chorus under the direction of Robert Shaw in performances with George Szell and the Cleveland Orchestra. Reines had prepared for the possibility of measuring the distant events of a supernova explosion. Supernova explosions are rare, but Reines thought he might be lucky enough to see one in his lifetime, and be able to catch the neutrinos streaming from it in his specially-designed detectors. During his wait for a supernova to explode, he put signs on some of his large neutrino detectors, calling them "Supernova Early Warning Systems". In 1987, neutrinos emitted from Supernova SN1987A were detected by the Irvine–Michigan–Brookhaven (IMB) Collaboration, which used an 8,000 ton Cherenkov detector located in a salt mine near Cleveland. Normally, the detectors recorded only a few background events each day. The supernova registered 19 events in just ten seconds. This discovery is regarded as inaugurating the field of neutrino astronomy. 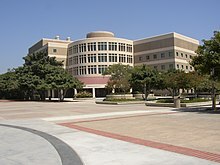 Frederick Reines Hall at the University of California, Irvine houses the Physics and Astronomy Department, and part of the Chemistry Department. ^ a b c Schultz, Jonas; Sobel, Hank. "Frederick Reines and the Neutrino". University of California, Irvine School of Physical Sciences. Archived from the original on February 20, 2014. ^ Present, R. D.; Reines, F.; Knipp, J. K. (October 1946). "The Liquid Drop Model for Nuclear Fission". Physical Review. 70 (7–8): 557–558. Bibcode:1946PhRv...70..557P. doi:10.1103/PhysRev.70.557.2. ^ Fermi, E. (1968). Wilson, Fred L. (trans.). "Fermi's Theory of Beta Decay". American Journal of Physics. 36 (12): 1150–1160. Bibcode:1968AmJPh..36.1150W. doi:10.1119/1.1974382. Retrieved January 20, 2013. ^ Bethe, H.; Peierls, R. (April 7, 1934). "The Neutrino". Nature. 133 (3362): 532. Bibcode:1934Natur.133..532B. doi:10.1038/133532a0. ISSN 0028-0836. ^ a b c Lubkin, Gloria B. (1995). "Nobel Prize in Physics goes to Frederick Reines for the Detection of the Neutrino" (PDF). Physics Today. 48 (12): 17–19. Bibcode:1995PhT....48l..17L. doi:10.1063/1.2808286. ISSN 0031-9228. Archived from the original (PDF) on December 17, 2008. ^ "Frederick Reines wins Oppenheimer Prize". Physics Today. 34 (5): 94. May 1981. Bibcode:1981PhT....34R..94.. doi:10.1063/1.2914589. Wikimedia Commons has media related to Frederick Reines.